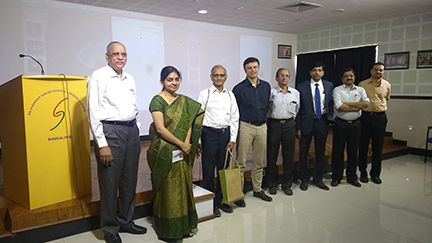 Raman Venkataramanan, PhD, FACCP, FAAPS recently gave a presentation at the Sri Shankara Hospital and Research Center in Bangalore India. His presentation “Clinical Pharmacology Aids in the Care of Cancer Patients” was attended by cancer specialists who attend to a large number of cancer patients in the garden city of Bangalore in India. This meeting was the first step in establishing a collaborative working relationship between the University of Pittsburgh School of Pharmacy and a Cancer Research Center in India. Venkataramanan is a professor of Pharmaceutical Sciences and Pathology at the University of Pittsburgh School of Pharmacy. Photo above: Raman Venkataramanan, third from left.